Hey Kids, Join Us For Camp Waggin’ Tails This Summer! July 8-12. Spaces Are Filling Fast! Kids ages 8-13 are invited to join us for our energetic and educational summer camp – Camp Waggin’ Tails! During our week long camp held at the Homeward Trails Adoption Center located in Fairfax Station, VA, kids will learn all about animal rescue, responsible pet ownership, positive dog training, hear from a variety of pet professionals, and work hands on with carefully selected adoptable dogs while engaging in fun games and projects designed to reinforce what we have learned. Registration is $400 per child and includes two daily snacks, all supplies, a water bottle and a Camp Waggin’ Tails t-shirt. Camps are limited to 16 children per session so register today before they fill up! To ensure your child’s safety and that they receive the individual attention they deserve Camp Waggin’ Tails operates with a minimum of one adult for every four children. Please contact rebeccag@homewardtrails.org with any questions or to register. Puerto Rice Supply Drive – Can You Donate Items to Help Care for Our Animals? Help Homeward Trails secure critical supplies to care for our animals in Puerto Rico. 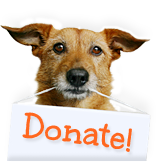 Every dollar in in-kind donations of items we receive means that we can spend that dollar on vet care and other important things we can’t get donated. Please consider donating and asking your family and friends to do the same Check out our wishlist here. You can order from Amazon and items will be shipped directly to our staff person on the ground in Guanica. IMPORTANT: Please note that we do not receive donor information from Amazon. If you would like a receipt for your donation please send you contact information and a copy of your invoice to donate@homewardtrails.org. Enjoy a relaxing yoga session surrounded by puppies, and feel your stresses melt away. Adoptable Homeward Trails puppies who will be running around, doing puppy things, or just sleeping during your class. Feel free to participate in the yoga class, or just spend your time playing with the puppies. Whatever you feel like. A portion of each registration will go to support Homeward Trails. Class is lead by a licensed yoga instructor and is appropriate for beginners to advanced practitioners. Please bring your own yoga mat and blocks, as these will not be provided on site. Please be prepared for puppies to act like puppies…they bark and go potty like cute puppies do! Class will start on time, so feel free to arrive a few minutes early. Class will last 30 minutes with the final 15 minutes for you to play with the pups (45 minutes total). Preregistration is required. All sales are final and non-refundable unless the class is canceled. You may transfer your registration to an alternative participant. All participant must sign an exercise waiver at the event. Parking: Please park on the street and not in the Caring Hands Animal Hospital parking spots. The Caring Hands Animal Hospital spots are reserved for dog and cat patients. We are grateful to Caring Hands for allowing us to use their facility. Please email doodlebugdogwalker@gmail.com if you have a party of 4 or more people for a discount code. Barley Mac is teaming up with Homeward Trails, a local non​-profit, no-kill rescue center for cats and dogs. Please join us Sunday, July 15th from 4-7pm for specialty cocktails and treats! Adoptable dogs on site! Monetary and/or supply donations for Homeward Trails preferred. We’ll see ya there! 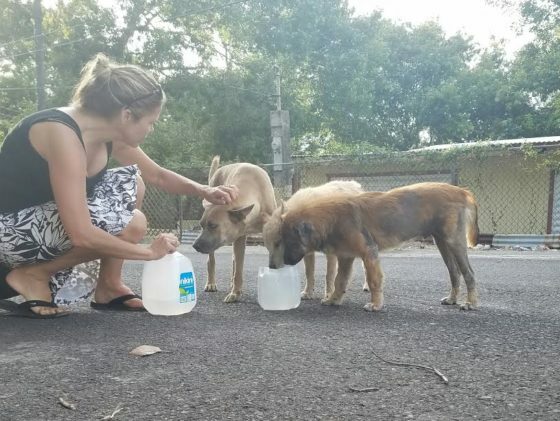 As you have all seen and generously supported, HT has been working hard to assist the dogs of Puerto Rico by covering medical care for them as well as transport off the island to adoptive homes here for over three years. This has been a rewarding experience as we have taken more than 290 dogs over this time, We have participated in both small and larger transports. Each fuzzy face that has arrived represents an amazing story of survival. Most of our partnering has been with the The Guanica Animal Rescue Project (GARP), an amazing group that was founded by Lynn Descoteau who moved to Puerto Rico from the US and was quickly overwhelmed by the number of animals needing help. She had to do something and contacted HT more than 3 years ago to partner. Her efforts have been instrumental in saving the lives of so many animals. She is a hero on the ground! However, as we all know, transferring animals is only a small part of the solution to a much larger problem. Transporting off the island alone will never solve the growing problem. While we continue to bring dogs to the US, the population of homeless dogs is growing, made worse by so many pet owners abandoning the island after Hurricane Maria and leaving their pets behind. And thus, we have decided that the time to further invest in this area and these animals has come. Starting on April 1st, Homeward Trails will be opening a branch in Guanica, Puerto Rico, the community in which we have been working for the last three years. What will this mean? We will continue with working the GARP founder under the umbrella now of HT. We will also be working in partnership with with several veterinarians in the area including our long-time partner, LaSuissa Vet Cinic. We are also very excited to have the support of the Guanica Mayor, who has officially invited Homeward Trails to Guanica to partner with his office and our vet partners to provide TNR (trap, neuter, return) programs for cats, ongoing transport for adoptable dogs, low-cost vaccines and spay/neuter for owned animals and community outreach programs about humane care of animals. We will have a full-time staff person on the ground in Guanica overseeing the animals we rescue and preparing them for shipment here. We will be increasing the number of transports we do in order to continue moving dogs off the island. We are SO grateful to the Animal Welfare Institute who has donated funding to purchase a transport van which will make larger transports possible! We will be implementing a targeted TNR program for cats. No one is talking about the cats and it’s heartbreaking to see all the homeless kitties who continue to multiply. We are thrilled to announce that we have received a donation of 20 traps which will be used to trap cats for TNR and dogs who are n need of prompt medical treatment. We will be working in conjunction with our partners to host community events where we will offer low-cost vaccines, education on TNR and humane animal care, and volunteer recruitment! We will be providing community outreach to residents including information on vaccines, spay/neuter, humane care of community animals and ways to get involved and assist our efforts. We also hope to begin offering hands-on volunteer opportunities for HT volunteers to travel to Puerto Rico to participate in these activities! There is SO much work to be done and we can’t do it without you. So much to do and we are SO excited to get started on this next phase. We are kicking off this program with a two-day fundraising event on February 26th and on 27th to celebrate WORLD SPAY DAY! For every $50 donated a cat will be spayed/neutered. Please consider a donation of any size to help us save kitties. ***We will post an announcement with the link to donate on Feb. 25th. Every dollar will make a difference and save lives. Join us on this new and exciting mission to alleviate suffering and bring long-term solutions to the animals of Puerto Rico who desperately need us. LET’S DO THIS HOMEWARD TRAILS!! It’s not too early to shop for your dog-loving Valentine! 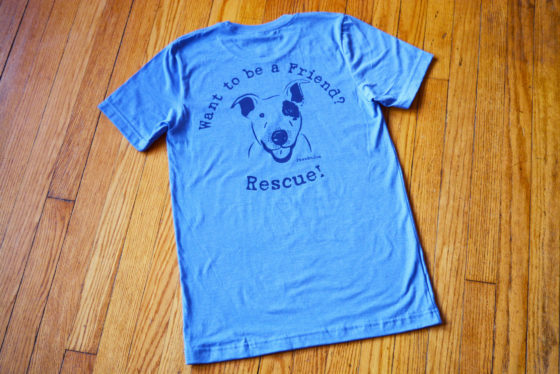 Until the end of February, a portion of sales from these great PawsGo “rescue” shirts will go to Homeward Trails. In addition to Valentine’s Day Red – they come in Ocean and Olive. Unisex sizes, they are a soft blend that looks great and fits well on everyone! 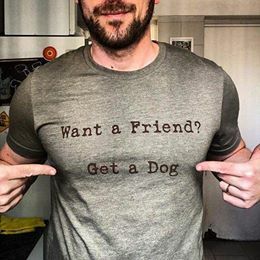 The front says — Want a Friend? 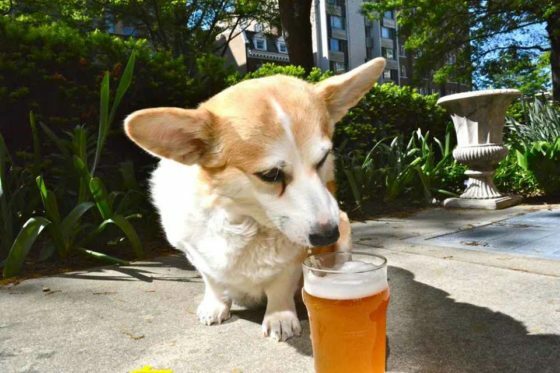 Get a Dog. On the back it’s — Want to be a Friend? Rescue! 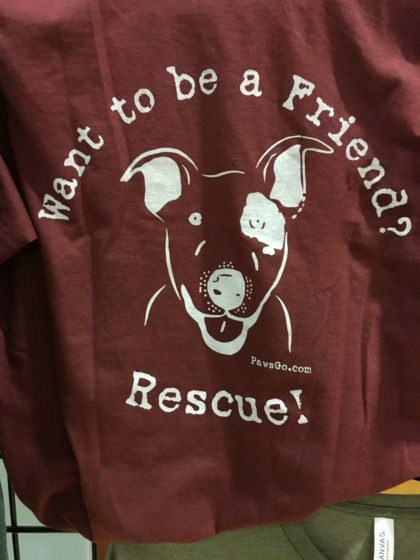 You can find these shirts at www.pawsgo.com, or if you’re near Alexandria, you can pick one up at the From Head to Tail Spa located at 430 Hume Avenue in Alexandria, VA.
Tent Donations Needed – Can You Help? 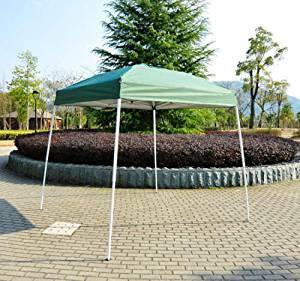 Our busy outdoor event season is about to start and we desperately need new tents to provide shade at our off-site events and at the Adoption Center. We are down to one functional tent and we have multiple outdoor events every Saturday and Sunday. Can you help us provide critical shade for the dogs, volunteers and adopters by donating a tent? We want everyone to be safe and cool while we are busy finding their forever homes. We have some tents on our Amazon wishlist, or if you have an unused tent a home that you would like to donate we would be happy to take it off your hands. 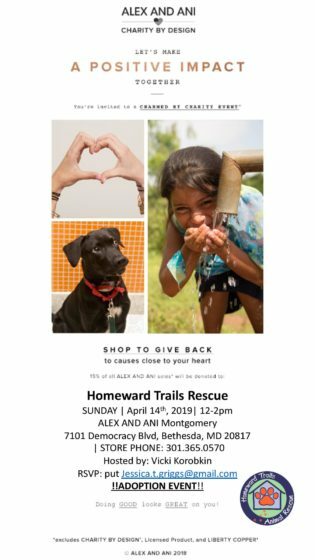 Contact rebeccag@homewardtrails.org with any questions. We treasure our volunteers and want to the thank you for your hard work! 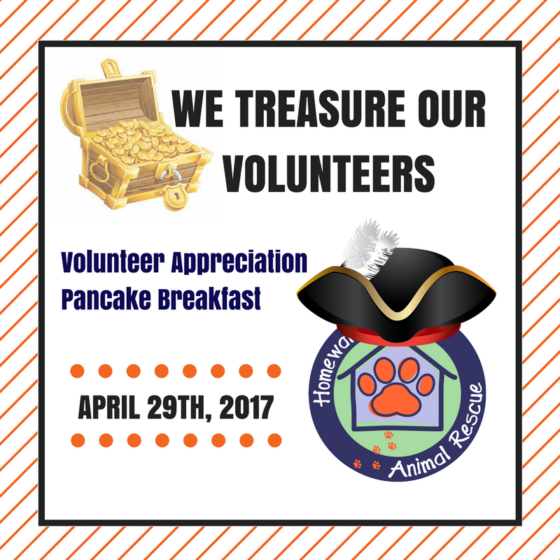 Bring your family for some yummy pancakes and other breakfast goodies and a fun morning of meeting your fellow volunteers and celebrating all the HT has accomplished because of YOU! We salute and congratulate our amazing partner and supporter Fur-Get Me Not, who is celebrating a remarkable 16 years of business. They opened as a part-time, one person, home based business in Arlington. Sixteen years later, the business has grown to include 140 employees in the Washington DC and Northern VA area with 3 physical locations. Fur-Get Me Not is also a regular supporter of many animal organizations in the DC area, including Homeward Trails Animal Rescue. We are so grateful for their support over their years and truly congratulate them on their many accomplishments. In honor of their anniversary Fur-Get Me Not is celebrating customers in a variety of ways through December 16th! – Fur-Get Me Not VIP and Premier dog walking and pet sitting clients receive a special treat (from Fur-Get Me Not’s boutique shop) within these two weeks. – Customer Appreciation Reception on Tuesday, December 13. Sweets for customers and a special treat for daycare dogs during our celebration party. Not a Fur-Get Me Not client? You should be. Check them out at www.furgetmenot.com.